Rich, fruity, zesty and boozy… nothing feels quite so festive as baking – and eating! – a classic Christmas cake. And once the booze has infused and all those lovely spices have worked their magic, top it off with a wreath of winter wonderland ‘foliage’ for a showstopping bake that will finish off Christmas dinner in seasonal style. Made in our 20cm Loose-Based Deep Round Cake Tin. Place the dried fruit, alcohol or tea, zest and juice into a large bowl. Mix well, cover and leave overnight. Preheat the oven to 160°C/Gas 3. Grease and double-line a 20cm deep round cake tin with enough baking parchment to extend about 3cm over the top of the tin. Wrap the outside of the tin with a few sheets of parchment paper and secure with string. In a large bowl, beat the butter, sugar and vanilla until creamy then beat in the eggs, one at a time. Add the flour and mixed spice, soaked fruit and any liquid and the nuts. Mix together then transfer the mix to the cake tin. Using a spoon, make a slight dent in the middle of the surface then bake for 90 minutes. Reduce oven temperature to 140°C/Gas 1. Loosely cover the top of the tin with foil or baking parchment and bake for another 45─60 minutes until a skewer poked into the middle comes out clean. Cool in the tin then remove and wrap in baking parchment. Store in an airtight container in a cool, dark place for up to 6 months. Every couple of weeks, feed your cake with a syringe, or by piercing with a skewer and sprinkling over a little more alcohol or tea. To cover, warm a little sieved apricot jam and brush it over the cake before topping with Ready to Roll Marzipan and then Ready to Roll White Icing. To decorate, knead the ready-to-roll icings until soft and then push them into the moulds – brown for the pine cones, green for the holly leaves, a well-blended mixture of green and white for the mistletoe leaves, red for the holly berries and ivory for the mistletoe berries – then flex the moulds to release. 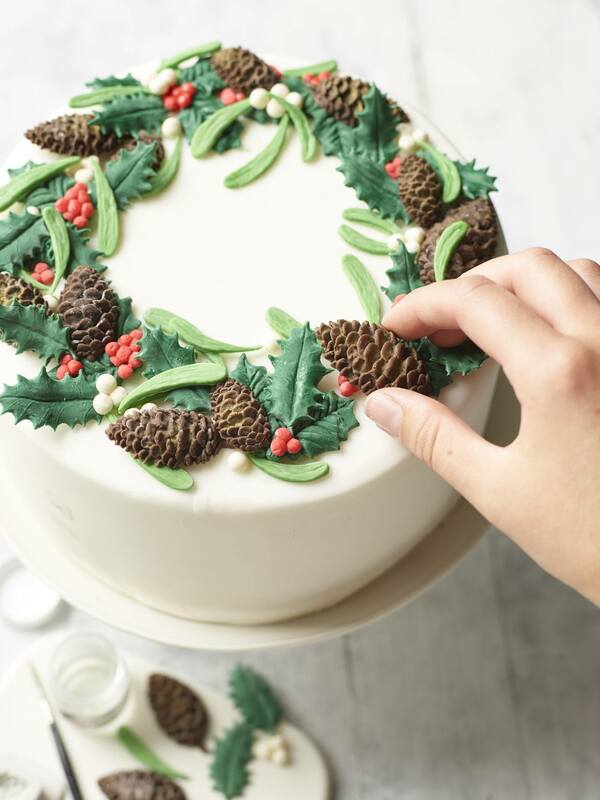 Using our finished cake as a guide, mould as many leaves, cones and berries as you wish to create your wreath. 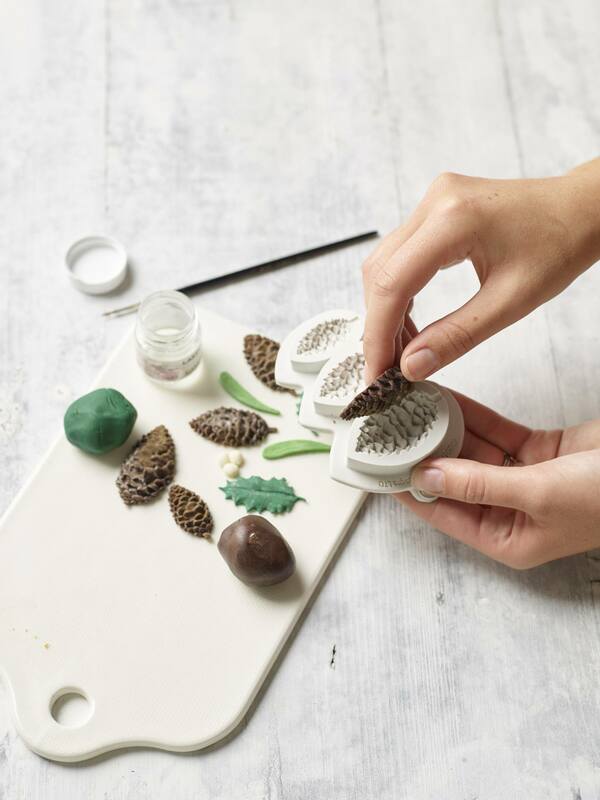 Once all your decorations are turned out, brush a little gold lustre over the pine cones, if desired. Build up a wreath of leaves, cones and berries on top of your cake, attaching each with a dab of edible glue.